On July 5, 2014, the night of my sister's birthday, and my friend Ryan's wedding, the Moon will be within half a degree of the planet Mars, and the pair will both be about 3 degrees from the 15th brightest star Spica. 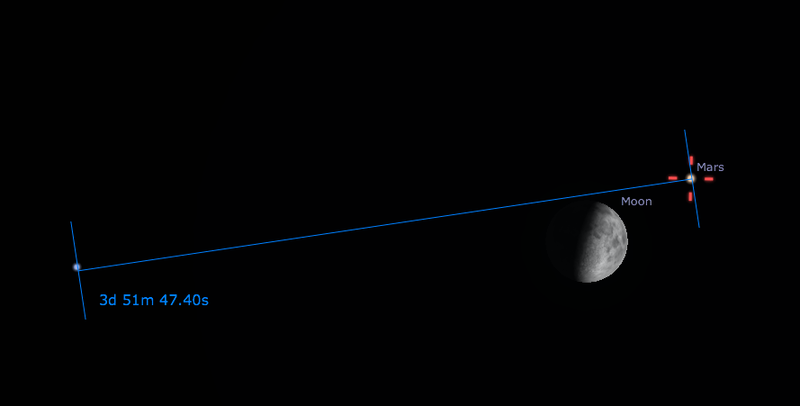 It should be a bright and interesting summer night conjunction! The position you see here is based on my location in Indiana. In South America the moon will actually move in front of Mars. This is known as an occultation, e.g. the moon will "occult" Mars. Every time I poke around in Stellarium I find new and interesting events. I suppose I could have just looked at the 101 Astronomical Events for 2014, but stumbling upon conjunctions is fun too. Moon Crater Atlas and Moon Crater Atlas, Get It?